Manchester United climbed up to 3rd place in Premier League standings with a massive win over Burnley in the midweek but the performances was one of the worst at home this season and even Van Gaal admitted that his team was lucky to win against Burnley but if they play like that against FA Cup opponent Preston North End, they are most likely to get beaten against League one side. The game will be played at the home ground of Preston North End, Deepdale and we can safely assume that Van Gaal will go with his strongest lineup against Preston. We take a short preview of the FA Cup 5th round tie and what possible Manchester United lineup. United suffered another injury to a defensive player in Phil Jones who hurt his knee early in the game against Burnley and is likely to be out of the Preston FA Cup tie on monday. Daley Blind also got a minor knock on the head which forced him to be replaced by Ander Herrera but he is likely to be fit and available for selection for fa cup tie. Michael Carrick is doubtful for monday night game, while Luke Shaw will return after serving his one match suspension. Apart from that Van Gaal has full squad to choose from and will be interesting to see what lineup he goes with against Preston. On paper united should put 4-5 goals past Preston and just brush them aside but this United team with all its attacking powers are struggling to score goals consistently, both Falcao and Van Persie has failed to deliver after a consistantly starting games in last couple of months. 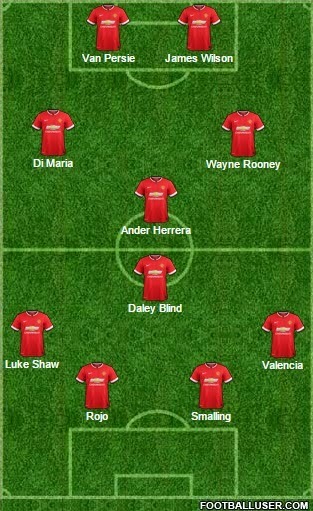 Some of the players are playing out of position specially Rooney. I think this is the kind of game where if Rooney play as a striker he is most likely to get goals than out of form Van Persie and Falcao. Even though United are playing badly but they have only lost 1 game in the last 18 matches so if they are finding it hard to impose themselves on opponents they are incredibly hard to beat as well so I am going with another win for United (probably a lackluster one). Its 2-1 for me in United favor.